The short and skinny of it - this beer sucked. It sucked so bad I didn't even take a picture of the bottle. I found this one on some dude's flickr account. 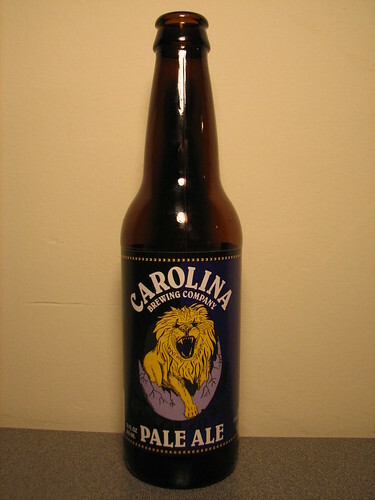 For a review of the Carolina Brewing Company, see this earlier post. When I opened this beer and took my first sip, I thought that someone had played a prank on me. Like that they had emptied the beer and filled it up with seltzer water instead or something. But then I realized that it wasn't April Fool's Day, so who would play a prank like this? Maybe this guy would, but he wasn't around today. Well, it turned out that shenanigans were not had, and what I was tasting actually was the CBC Pale Ale. This pale ale lacked any taste of any sort, it was probably the weakest pale ale I've ever had. It kind of tasted like a pale ale, but like I said above, I thought it was beer-flavored water. That being said, I could have probably drank 10 of these in a row (if I could space them out over 4 or 5 days, cuz I'm a lightweight). It does have a decent ABV of 5.6%, so pair that with its easy-goes-down-the-gullet character, you could get wrecked pretty quickly - but not for cheap though, these guys run about $9 for a six-pack in these parts. I picked up a single bottle of this pale ale for FREE at a get-together today, which is a good deal. You know whats weird, the other CBC beer I reviewed before I also consumed for free at a get-together. What is it about Carolina Brewing Company beers and me consuming them as free party beers? Are people trying to get rid of the stuff? Hmmm. Do yourself a favor and stay away from the CBC beers. Unless they are free, cuz they still give you a buzz, which is what it is all about. Dawg. thats not a bad deal. usually i only give away my dads beer at parties. that's the best kind of beer to give away!